No, I always liked Bryan Hitch’s “Ultimates” version without them. I’ve long considered those wings one of the most ridiculous uniform elements around. Nice up close sketch. Reminds me a bit of Wilson from Home improvement. Great detail on the eyes, but I think his eyes look too evil. Also, the gaps on the sides of his head are not appealing. I was never a fan of the wings on his mask either. Hopefully in the movie Cap will be wingless as well. I have to disagree with you both. Cap is not Cap without the wings. Taking his wings, is like taking his shield, it just doesn’t work. 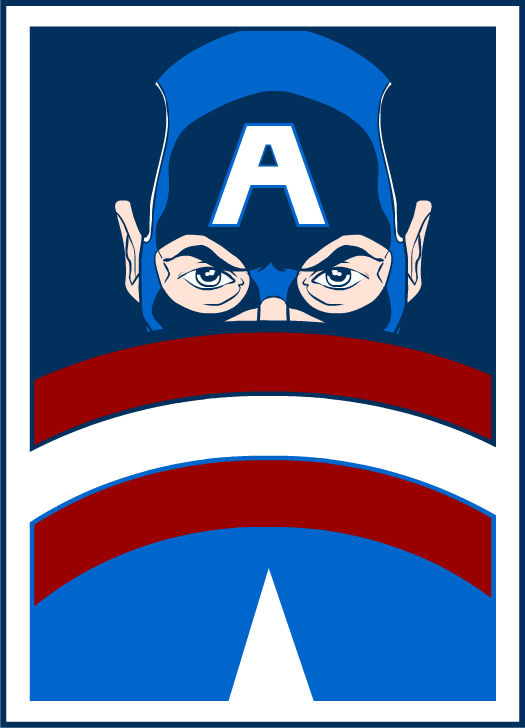 I always felt that the wings on Caps headgear represented freedom. Keep the wings. If they’re good enough for Jack “King” Kirby they should be good enough for everyone. Note I went ahead and added an alternate version with the wings. Lamest. Headgear. Ever. haha, your a funny guy Jeff. I mean that in the comedic sense of course. 🙂 Like I said I like Cappy’s wings, but to each his own. I take it you could do without the Flash’s earbolts aswell? Actually I wonder how he would look without them? I actually LOVE Flash’s earbolts, I think they complement the entire look perfectly. Plus they look cool all streaky as he zooms by. 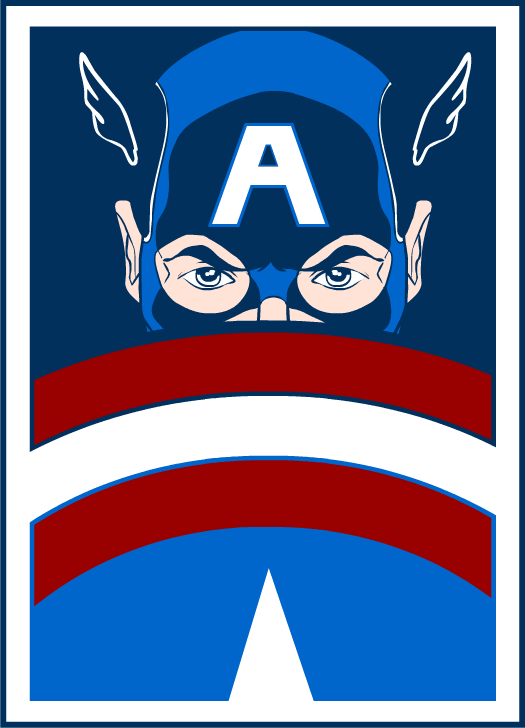 Cap’s wings, though, are completely random. What part of that outfit other than those tiny, pathetic little winglets says “bird”. I suppose at some level it’s a bald eagle reference, but that’s an awfully big stretch. And I keep imagining them flapping around limply in battle. How do they even stay attached given how active he is? Honestly, come on, I know people are used to them by now and they’ve become iconic, but setting aside the comfort factor, they’re really, really lame. Although I hasten to add that you are absolutely correct, MartianBlue, to each their own — it’s totally fine for you to like them and for me not to, that’s what makes this world a fun place. I mean, yeah, you’re wrong and all, but still. Ha ha! haha. Funny. Your in the wrong line of work. :) It’s a little known fact, Cappy has a metal plate in his head, and the wings are magnetized, hence the inability of losing them, sheesh Jeff, you should know that :D. I have to agree that diversity is what makes this world great. You take people like me, as great as I am, It just couldn’t be so, without people like you. (This is where you insert the witty comment about me being right, because your making the program so I can bring my creations to life, by mixing and matching your HM items) I kid, I kid. New topic, I’m actually curious as to see you create an original hero portrait. Some of your earlier redesigns have been pretty good. What, do you mean an original never-before-published-anywhere character I made up, or an original redesign of an existing character? Ultimate Captain America > 616 Captain America. I’m a hater because I like the wings? No, you’re a hater because you hate the not-wings Cap. You’re a lover because you love wings-Cap though, so it all evens out. I was referring to a 100% original never-before-published anywhere character of your very own. A costumed hero, such as cappy, spider-man, flash, etc. Maybe a supervillian, maybe not, with a small description of his abilities and how he got his powers? I’m just curious as to what you would come up with. Hey MB, Jeff gave us Icelandosaurus. True, true. And as cool as it was, I was hoping to see a costumed hero. Yah, I read ya MB. We’ll see, I am working on the one for today still.